Secure and Permanent method for retiring employee credentials such as ID Badges, Passports, etc...perfect document control for both laminated and PVC Badge materials. Note: The top of the perforated word will be approximately 1/4 inch from edge of the badge. Operation is Fast, Easy, Safe and secure. 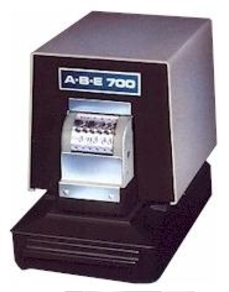 Desktop Size - The model 700 FD-1 Security Perforator takes no more space than an average letter tray. This unit includes the following features, which are required for correct positioning and proper performance when perforating Badges; (1) Finger Trip Switch, (1) Fixed Guide, (1) Throat Restriction.